Unai Aranzadi has once again joined us on the blog to share with us the beautiful story that relates one of the Basques who committed himself to fighting against fascism to a young professional politician from Catalonia who could be, as there is a distinct possibility, the new President of the Government of Catalonia. When we received the article, we immediately had two ideas. The first, that of the agreement between Lehendakari Aguirre and President Companys, as the highest representatives of the Basque and Catalan nations, helping each other in the fight against fascism. We’re sure they’d be happy to know that the Catalan great-granddaughter of a gudari could end up being the President of the Catalan Government in today’s political climate, which is so strange and so far removed from democratic normalcy and respect for Catalan institutions. The other image was that of the Tree of Guernica and of the verses by Iparragirre in the song that became the anthem for all those who dreamed, and dream, of recovering Basque freedoms: “Gernikako Arbola”. The Basque surname Artadi could be translated into English as “oak grove”, as “artea” in Basque refers to the holly oak, Quercus ilex, which is closely related to Quercus robur, the common oak, the species of the Tree of Guernica. Artadi is a surname that stands out as being from that area, as the region around Mundaka, the Urdabai, is rather unique in that most of the trees are these oaks, as well as around Kanala, Katillotxu, San Pedro Etxarre, Ogoño, etc. It’s a lush, green oaky area, which is rather unusual on the Basque coast. Elsa Artadi Vila, the representative for Junts per Catalunya that the Spanish media see as the replacement for Carles Puigdemont to preside over the Catalan Government, has Basque roots on her mother’s side (while the custom is usually to put the father’s surname first, Ms. Artadi has her mother’s surname first, while her father’s, Vila, is second). 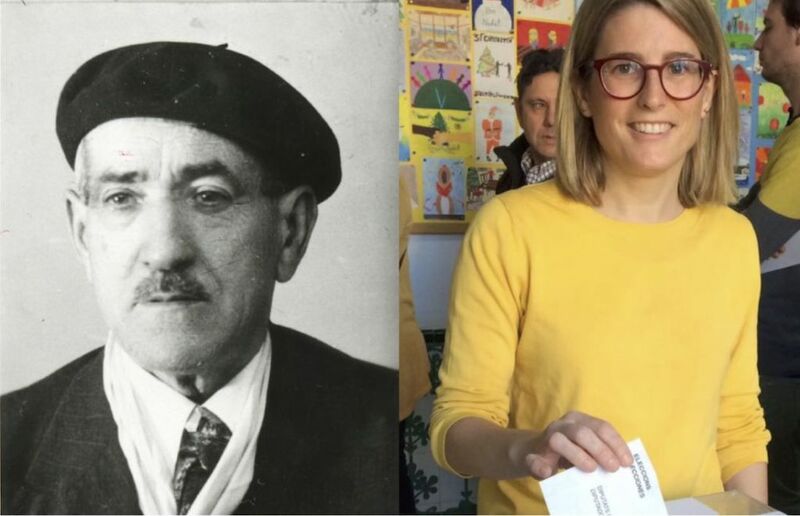 Originally from the Biscayne town of Mundaka, the couple, Vicente Artadi Bilbao and Beatriz Ormaetxea Gerrikaetxebarria, had eleven children, many of whom put down roots in Catalonia. Such was the case of Julián Artadi Ormaechea, merchant marine captain and the grandfather of Elsa. Vicente Artadi Bilbao, Elsa’s great-grandfather, played a role that several witnesses and chronologists have called heroic as the captain of the Basque auxiliar navy during the Spanish Civil War. With the audacity that has characterized Mundaka’s seamen for centuries, he helped with the evacuation of Gipuzkoa and made countless trips between Biscay and France, transporting refugees, sweeping mines, and hauling material for the Basque Government. In a horribly mismatched battle, with civilian boats such as the Trintxerpe and the Mourisca, this 62-year-old volunteer once and again avoided being captured by the Almirante Cervera, the Velasco, or the Canarias, the enormous cruisers and destroyers that the fascists tried to blockade the Basque coast with. When the war in the Basque Country was lost, the couple had to take refuge in France, until they were able to return to the peninsula. Vicente Artadi Bilbao was born in Mundaka, and was a militant of the ANV party. He enrolled in the Auxiliary Navy at the age of 62, which made him the oldest man to serve in it. As Captain, he first sailed the ‘Trintxerpe’, which participated in the evacuation of Gipuzkoa and created the first radio link between Bilbao and Bayonne. In January 1937, he took command of the ‘Mourisca/D-4’ minesweeper, which also transported people, correspondence, and materials between Bilbao and Bayonne. He was its captain until the end of 1938, even when the boat came under the command of the Council of Industry. He was exiled to France at the end of the war. And it just so happens that his first job as a seaman was as a cabin boy on one of the last sailing ships that sailed the route between Bilbao and the Philippines.